Fresh nose, lots of fruit (banana, citrus, tropical fruit (not my strongest side), waxy and fresh clover honey, light wood tones. Fruity, somewhat sweet honey, now some nutty tones (cashew, almond, etc.). Very washing. Very nice, but stays nice and cool. Long honey sweetness, combined with some bitter wood tones and a light spiciness, combined with dark fruits and some granularity. Less waxy but more creamy than cask 6935. Honey, vanilla, apple, whipped cream and tangerine. More of the latter when adding water. Whipped cream, honey, almond, caramel and apple. With water some orange at the expense of the cream, and then also some wax. Honey, creamy caramel, vanilla pudding, orange, almond and apple. A very constant whisky from nose to finish, of good quality. Fresh style, quite clean, with vanilla, polished oak, wax, barley and hay. The fruity side reveals apples and oranges. There is a faint smell of cinnamon too. Sweet, but less sweet as the nose suggested. Honey, vanilla, but ample pepper, orange, apple, lemon, melon, mint. Fairly long and pleasant. It's well-balanced between sweet, sour and bitter. The pepper is quite present, but not in a disturbing way. Furthermore, there are fruit and hay. Bourbon cask fragrance. Biscuits, tropical fruit. Banana, mango. Sugared peach. Not overly complex, but very drinkable and likeable. Quite some wood there on the nose, the time of bottling seems right. Cinnamon, caramel, pears, honey and black tea. Nice. Sweet and fruity with extensive notes of toffee, caramel and oranges. I believe it's the hoghshead influence since these notes are not typical for bourbon casks. Rather long, mouthwatering with the sweetness of toffee lingering. 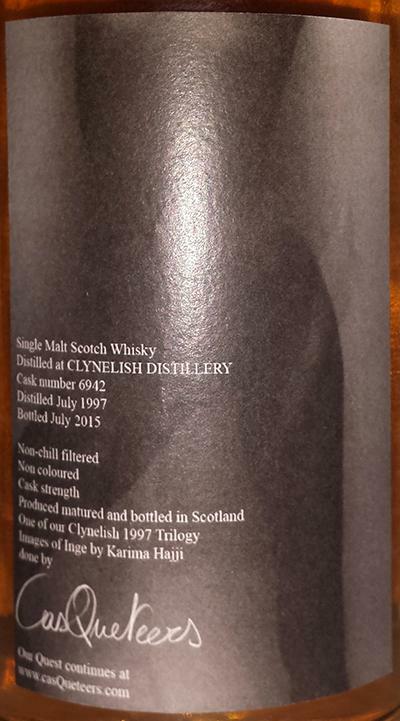 Bit of an atypical Clynelish, both the nose and the palate. But I really like the earthier flavours and the fruity finish. Sweet arrival with vanilla, marzipan and marshmallows, but it quickly becomes fruitier. Some (sour) apples, lime and grapefruit followed by bitter oranges. Ends on a grassy note, straw. Menthol and a pinch of pepper. Then luscious white grapes and candied lemons. Also some fresh tobacco leaves and mocha. Traces of smoke. Fruity finish. Melon and pear.